How do you know if your home is electrically safe? Here are some simple electrical safety checks you can undertake in your home to check your electrical installation is in good working order! The fuseboard is the heart of the electrical system in your home. Essentially, everything electrical in your home points to the fuseboard. This is why it is so important that it is working safely. All fuseboard’s should have a main switch and fuses and/or circuit breakers. If the circuit breakers regularly trip or your fuses regularly blow then it means there is a fault in your electrical installation. Today, a new fuseboard will have a metal case around it. Older fuseboard’s are in plastic casing and this is still fine. 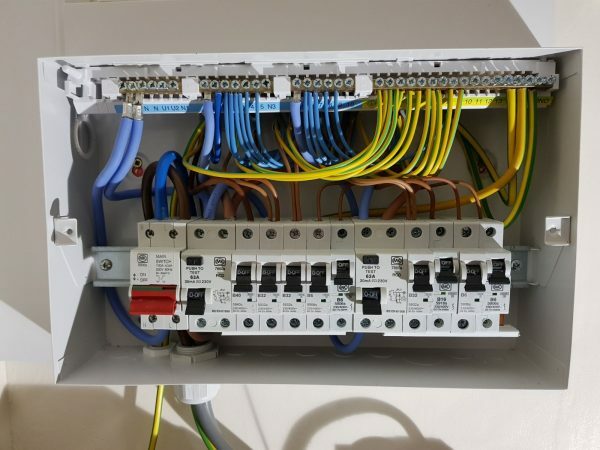 However if your fuseboard is mounted on a wooden board, has cast iron switches, is made of brown Bakerlite or looks as though it is a mix of different fusebard’s then it is old, not sufficient for the electrical usage in a modern home and needs to be replaced. Please contact us if you have any concerns about your fuseboard and we can come and take a look. RCD stands for Residual Current Device. RCD’s plug into fuse board alongside the fuses which supply power to your plug sockets. If there is a fault in the circuit the RCD detects the change in electrical flow immediately and automatically cuts the electrical supply. Therefore, if an appliance plugged into the circuit has a fault, it will detect it, trip the circuit and in doing so instantly cut the flow of electricity to the socket feeding the appliance. For example, if an appliance or socket sets on fire or a cable is accidentally cut the damage this would cause is instantly limited. An RCD is a life saving device. To test if your fuseboard has RCD protection simply press the “Test” or “T” button on your fuseboard. If you have one it will immediately switch off the power to the areas of the home that the RCD protects. If you do not have RCD protection in your fuseboard then you can use plug in RCD’s for all the socket circuits in your home. 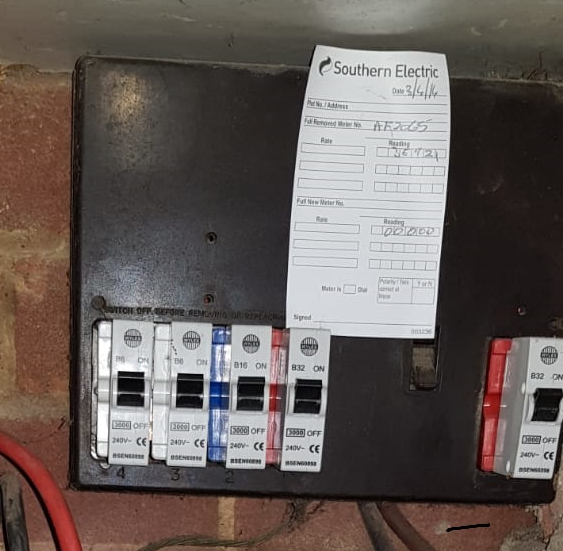 To ensure you use the correct type of RCD for your fuseboard and that they are properly installed please contact us and we will be happy to help you. Fuseboard with duel RCD protection. 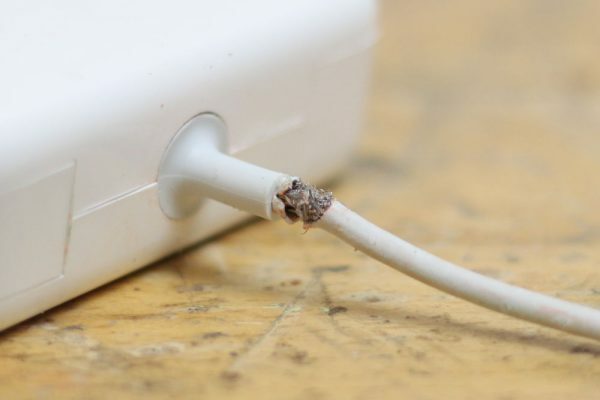 General wear and tear can cause damage to appliance plugs and the sockets they are plugged into. 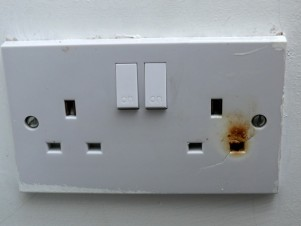 Things to look out for a cracked socket face plates, visible burn marks, crackling sounds. The plug or wall sockets may also be hot to the touch. Socket face plates and wall mounted sockets, in particular, can become loose. Sockets mounted on skirting boards do not meet electrical safety regulations and will need to be re-positioned. Do not overload your sockets. Think, if you need to use an multiple socket extension to you need additional socket installed? Over loaded sockets can, and do, result in fire. It’s unlikely you will have one but if you do have round pinned sockets, these are also out of date. As with plug sockets check light switch face plates for signs of cracking, visible burning or discolouration. This could indicate loose or inadequate wiring underneath. 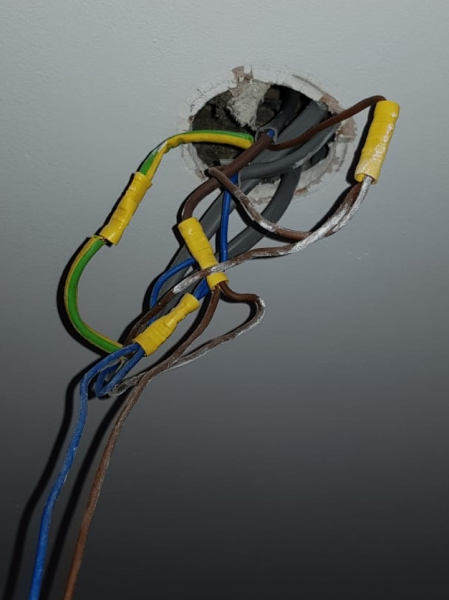 Check to see if you have any loose connections on ceiling light fittings. Keep an eye on down lights and if you are concerned about them, ask yourself why? Can you hear a crackling or buzzing sound, do lamps regularly blow, is there any sign of discolouration? If so you will need to get the wiring in the ceiling void checked. It’s important to know all light fittings in bathrooms should be IP rated. This means the fitting is protected from water ingress. It will extend the lift of the fitting and ensure your bathroom is electrically safe. It is important all electric cables in your home are in good condition. An easy test is to check the PVC sheath of the cable is in good condition and not loose or damaged,scuffed, cut, cracked or heat damage. Cable on old appliances or electrical installations may become cracked. Damaged cable is not fit for purpose and could cause electric shock, burning or fire. Damaged cable on appliances will need replacing. The cables within your homes electrical installation will be embedded in the walls or in surface trunking, under floorboards, in ceiling cavities and loft spaces. It is important you know the position of cables embedded in the wall and where they lie under floorboards and ceilings so you do not drill or nail into them. This will damage the cable and also YOU! This is when an RCD will save your life. Cables run across floors, under carpets or along thresholds can become a trip hazard. Avoid this. Both smoke and carbon monoxide alarms can be hard wired into your electrical installation or battery powered. Both types of alarms should be tested regularly, weekly if you can. Simply press the test button on the alarm fitting. We advise the motto ”Test it Tuesday”. Batteries on both hardwired and battery powered alarms should be changed every year to ensure they are working well. Smoke and carbon monoxide alarms expire. 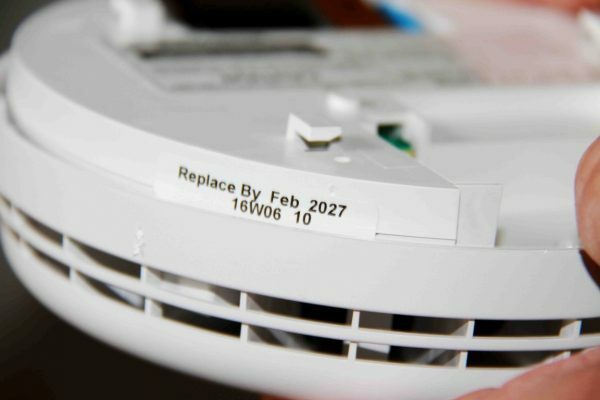 It is important to check the expiry date is printed on the side of the fitting. If it has expired it needs replacing. The life span of this product is 10 years. Smoke alarms should be installed on each floor of the building. If you have an open fire, log burning stove or boiler, then there should also be a carbon monoxide alarm in the room. If you do not have a smoke or carbon monoxide alarms in your home you, need to get them installed. Battery powered alarms are simple to install or we can hard wire them for you, ensuring they are in the correct position. If you are concerned about an elderly friend or relative you can suggest they contact their energy provider to be added to the priority service register. Once on the register they become eligible for a tailored billing service, free meter readings and should something go wrong with their cooking or heating facility they are treated as a priority. After all if anything is going to happen… it is likely it will be when the weather is bad and they need it most. If you are worried about the condition of the electric installation in your home or you know that the installation is older than 30 years old and not been recently tested or checked we can provide your with an EICR. This is where we test every part of your electrical installation. The results will show any deterioration or damage and the report will confirm the condition of the electrical installation and if any remedial work is required. If you have any questions regarding your electrical installation or would like us to come and check any issues or concerns you have please click here to go to the contact form below and we will endeavour to get back to you as soon as possible.